Despite making his professional debut 15 years ago, Russell Martin is still loving going to work every day. 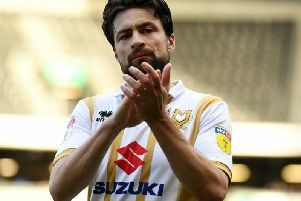 The 33-year-old celebrated scoring his first goal for MK Dons since he signed for the club in January when he netted the winner against Forest Green on Saturday, sending them into second place in League 2 with six games remaining. Martin has barely missed a game since he signed from Walsall, bringing much-needed experience and nous to the side - especially vital when other centre backs have fallen by the wayside through injury of late. But with in excess of 500 games under his belt, including Premier League and international experience, Martin says he loves coming to work at MK Dons. "I'm loving it, to be honest, and I think I'm getting better as games go on," he said. "I hope I've got three or four years left to play, we'll see, but I'm enjoying every minute. "It's great group of lads, I enjoy working with Tis who is an excellent manager. It's a really good environment, a really good club and it makes it really enjoyable to come in to every day. And to be a part of a promotion push as well, I said to the lads that these don't come around very often. Some players go an entire career without one so for us to be a part of one, we want to see it over the line." Manager Paul Tisdale added: "At the moment he is proving to be a significant signing. Whatever the age of the player, whatever his skillset, players in the right place with the right thoughts tend to trump everything else. "He makes plenty of good decisions, and he is bringing an air of composure and structure to what we do. I'm delighted he has a goal, and he has deserved it."